There's nothing to my latest cheap$kate recipe. 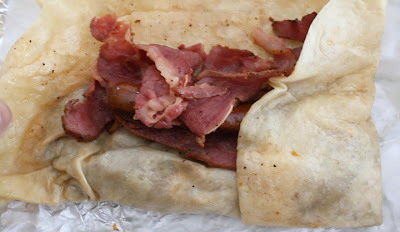 You could find it at any work site food truck, and I used to get one quite often. This is early morning simplicity, just a fried egg between 2 slices of bread. And eggs are cheap. Local markets and even chain groceries carry, or bake on site, all types of bread. Spit a warmed buttery croissant or slice off some fresh baked baguette to elevate the lowly Egg Sandwich. The varieties of an Egg Sandwich are endless -- is the egg yoke cooked through or left runny, is the bread toasted or not, do you top the sandwich with two slices of bacon, a slab of melting cheese, mayo, lettuce and tomato? It's up to you, just use what you have on hand. 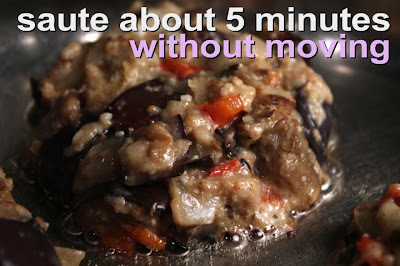 And it's certainly easy and quick enough to do any time of day. 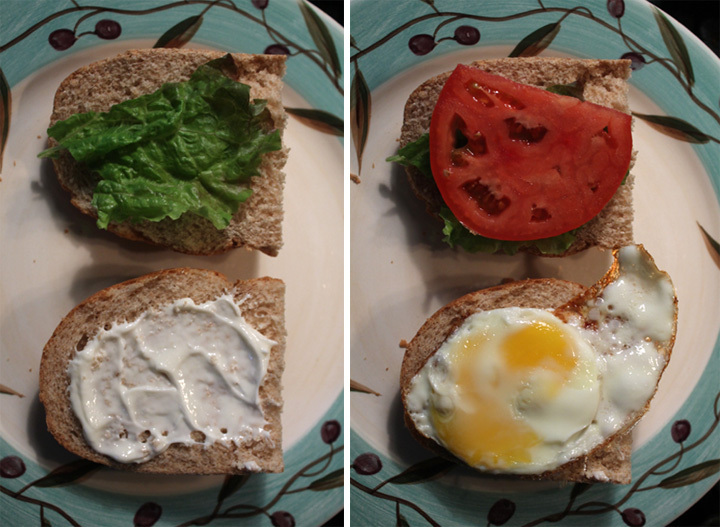 That's what I like about an Egg Sandwich. This is my version. 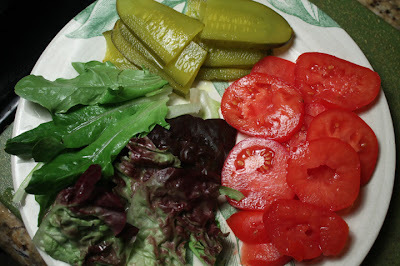 Sandwich toppings - lettuce, tomato and mayo. Teaspoon of oil or oil spray for frying egg. Fry an egg. I break the yoke and just let it cook on one side until yoke is half cooked. 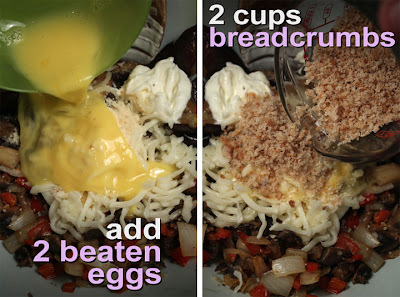 That way you get some crunchy whites edges and creamy yoke. You could do a light scramble too. Of course cook the egg as you like it. 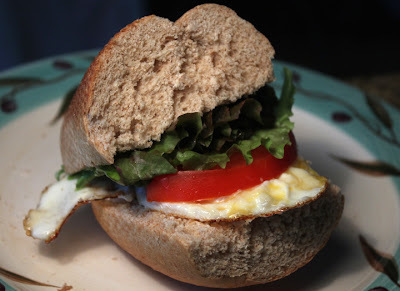 Use toasted or plain bread to build your Egg Sandwich. And top with your favorite sandwich condiments. 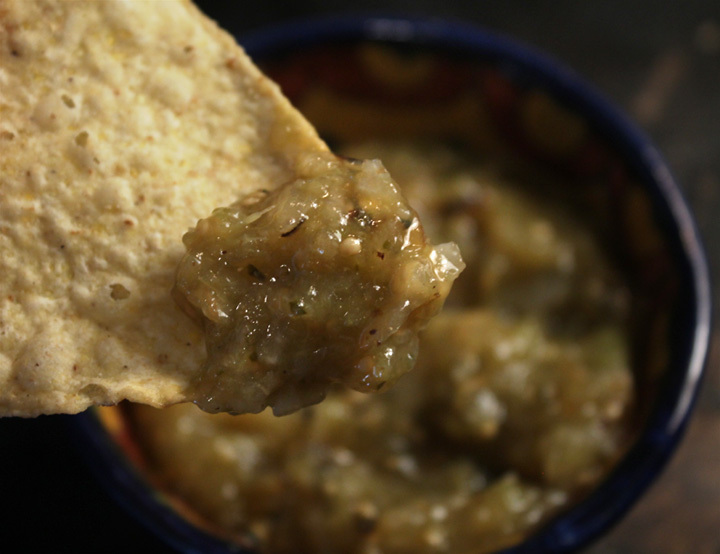 Bright and tart, The 99 Cent Chef's Roasted Salsa Verde will have you emptying a bag of tortilla chips. So I apologize for showing you how to made a delicious salsa that you can't stop dipping chips into. 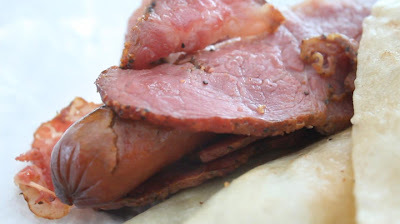 This taco truck favorite cools down any grilled carnitas or carne asada taco filling. It's always difficult choosing sides: spicy and smokey Salsa Roja (recipe here,) fresh chopped Pico de Gallo (recipe here,) or a tart Salsa Verde. Los Angeles has Latin markets in almost every neighborhood, so it's easy to find the main ingredient in a Salsa Verde, tomatillos. Even some regular markets around town carry them. 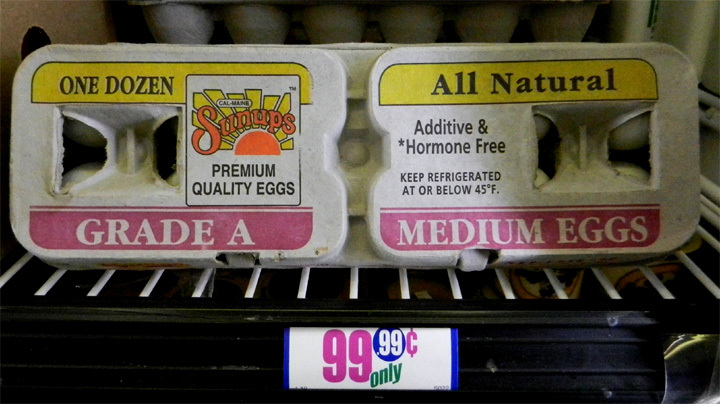 And they are certainly cheap enough, usually less than a dollar per pound. 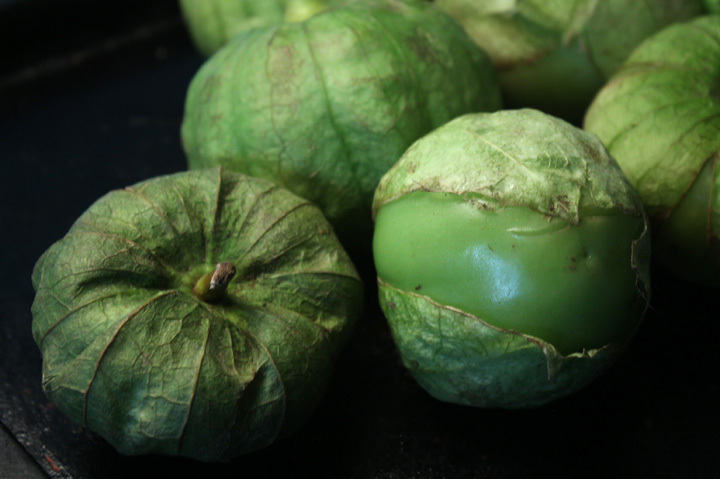 Select a tomatillo that's pale to bright green (under the papery husk) and hard like an apple. 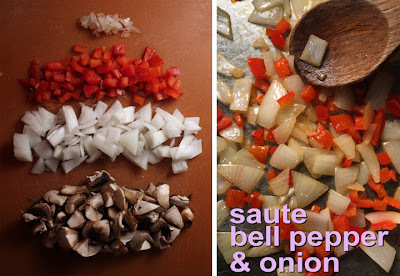 You are basically making a dipping sauce for chips, veggies, or a topping for tacos, burritos and enchiladas. 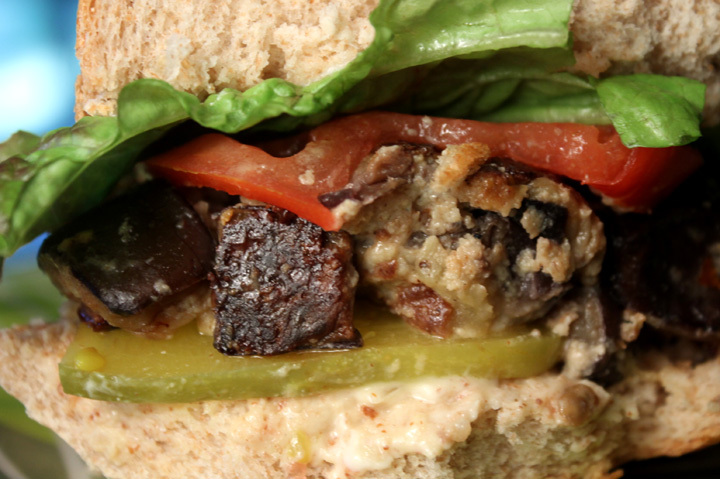 Every Lating eatery make their own version. 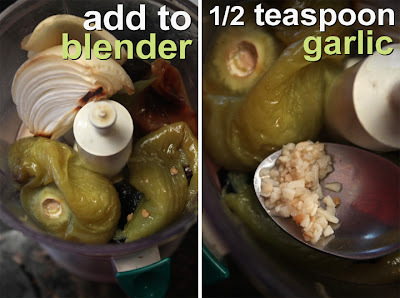 Some are made mild with boiled and crushed tomatillos, others are roasted sweet with black flecks of charred tomatillo and chiles (my version,) and at the Border Grill, here in LA, they do theirs super sour and fresh, with what must be barely cooked, or raw tomatillos! I love them all. 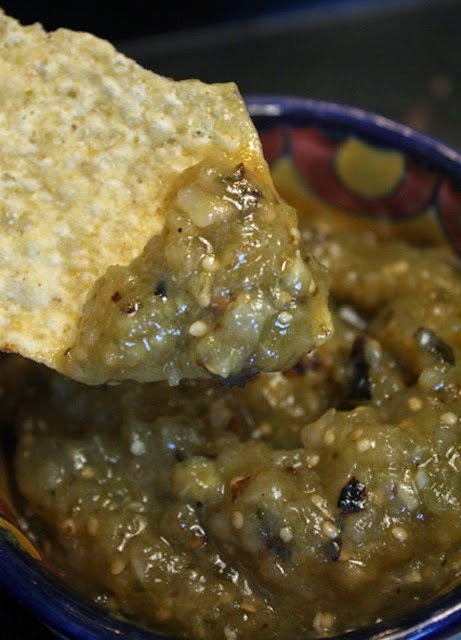 So if you can find tomatillos by all means try out the Chintzy Chef's brightly flavored Roasted Salsa Verde - it will be a new favorite for you. 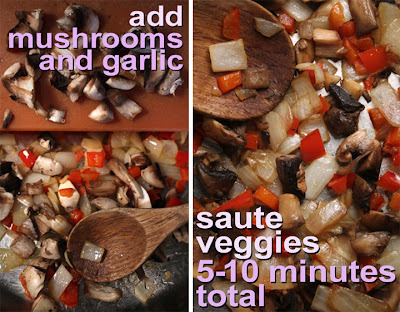 1 clove chopped garlic - or 1/2 teaspoon from jar. 2 large chiles or a couple smaller ones - optional. Mild like a pastilla (poblano,) anaheim, or any peppers. 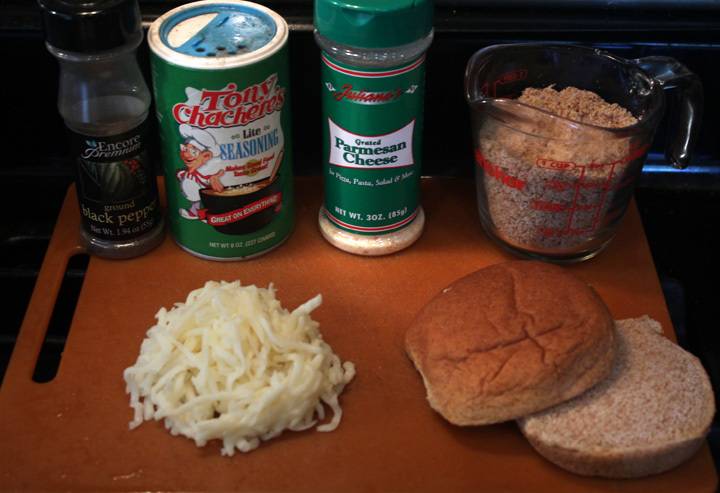 Okay to add a jalapeno, but add a little at a time to desired spicyness. 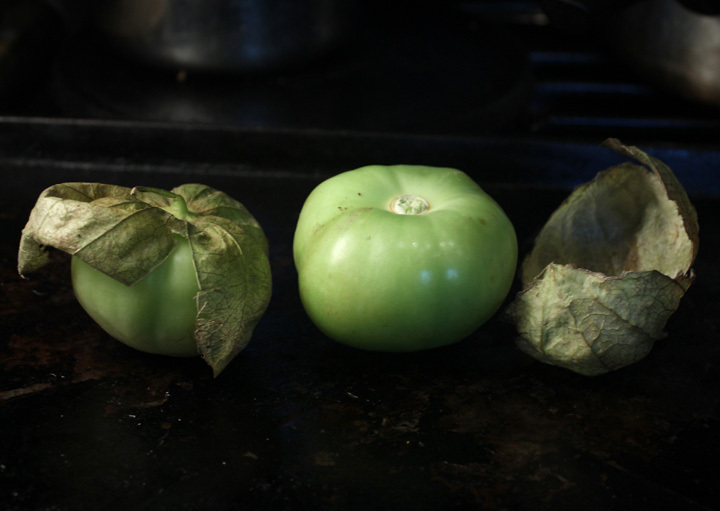 Heat oven to 375 degrees, Peel off papery husk covering to reveal bright green tomatillos. Also peel a large onion and cut into quarters. Spread out tomatillos, chiles, and chopped onion on a large cookie sheet (or large pan.) It's okay if veggies touch each other - you could even do some stacking if your pan is too small. Bake for about 45 minutes until tomatillos start to brown/blacken. They do not need to blacken all over - same with the chiles. Okay to remove any ones early, that blacken too much. 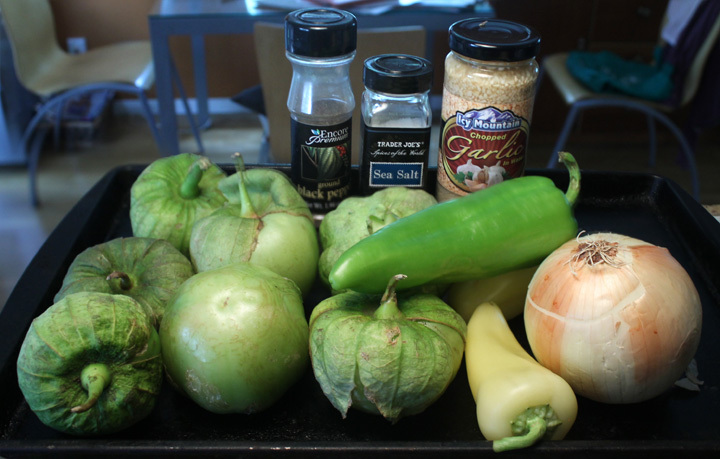 I like to have about half black/green tomatillos. 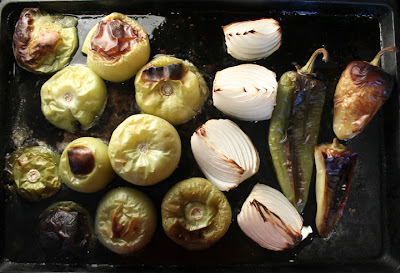 After roasting tomatillos, onion and chiles in the oven, remove and allow to cool about 5 minutes. 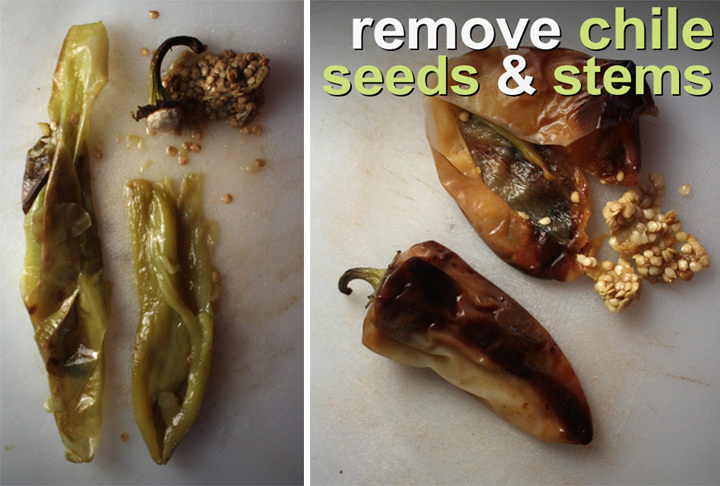 For the chiles, peel off some of the skin and remove the stems and seeds. You don't need to remove all the charred skin. Finally salt and pepper to taste. Refrigerate until ready to serve. I made my Roasted Salsa Verde with mildly spicy chiles, but you could leave them out for a cooler version. 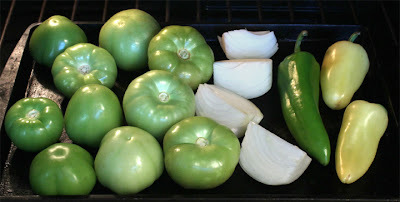 You can just low boil or steam the tomatillos and onions for about 10-20 minutes until soft. Or simmer for 5 minutes for a fresh and tart salsa. Finally blend it all together. Salsa Verde will keep a week or so refrigerated. 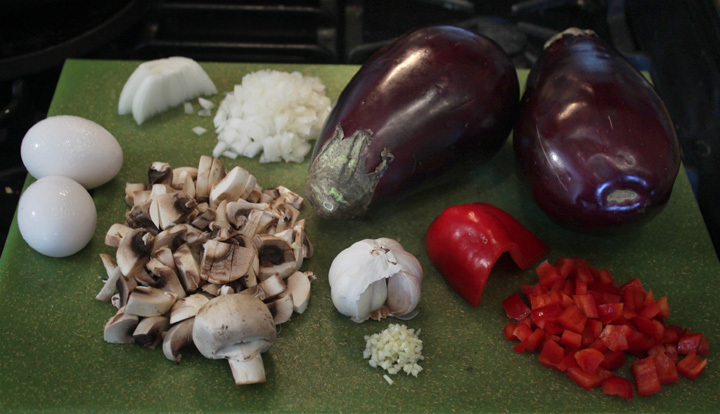 Now each ingredients may not be top notch, but when brought together, the Oki-Dog is a tasty hot mess of a burrito, and not for the faint of palate. Oozing hot cheese and chili with each bite, the two grilled hot dogs have a welcome thin-skinned snap and the thick sliced pastrami brings it over-the-top with peppery, corned beef cured flavor. 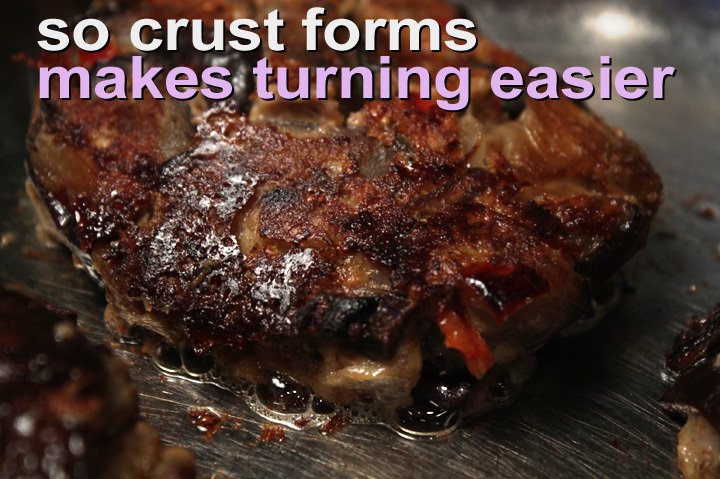 The ingredients are fried on a flat top stove. There are heating bins that hold boiled hot dogs and chili. The Oki-Dog is a 2 tiered construction. In the outer tortilla fold is a wiener and all the pastrami. The center of the burrito is stuffed with chili, cheese and another wiener. I haven't had the appetite to try an Oki-Bomb (sauerkraurt, pickles and onions are added) but can only imaging how huge that would be. It really shouldn't work but it does. For just under 4 bucks, it's a substantial meal. If you can finish one with an order of fries, you are one hearty eater or a teenager. 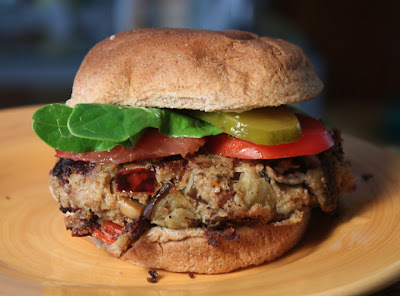 My own wolfing-it-all-down days are over, so half of an Oki-Dog is just about right for me - that's no problem, as this veggieless entree heats up perfectly in a microwave for a second go-round. 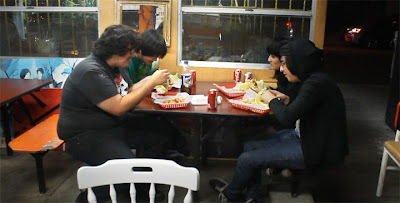 Oki-Dog is now located on Fairfax Boulevard near Melrose Avenue (since 1983,) down the street from my favorite cinema, the Silent Movie Theater, and even closer to Fairfax High School (were alums, the Red Hot Chili Peppers, attended back in the day.) Many young and impressionable teens have had their taste buds corrupted here. 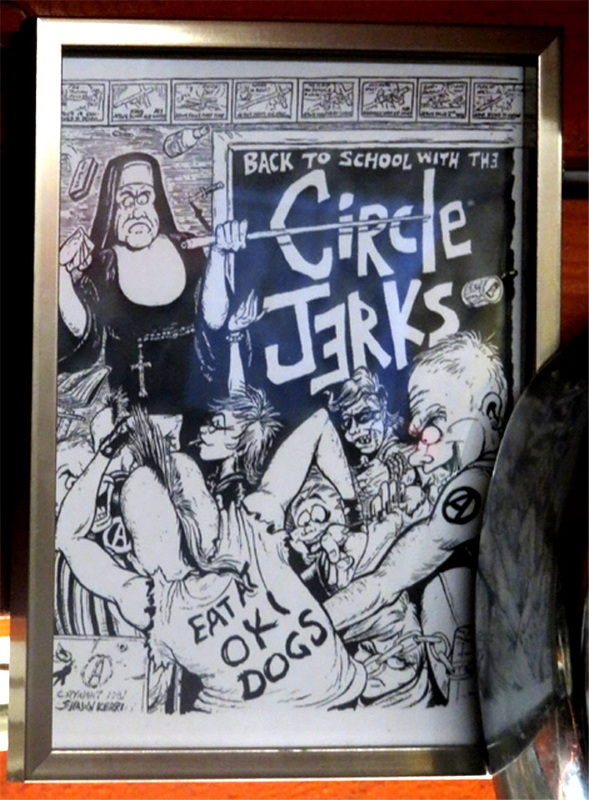 But that is all part of Oki-Dog's long and checkered history. 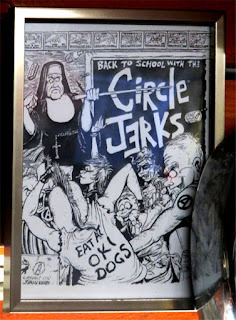 Originally in West Hollywood at Vista Street on Santa Monica Boulevard, in the pack pocket of Boys Town, Oki-Dog was the place to be and be seen by LA's punk rockers in the late 1970's (wild blog article of those heady days here.) Hundreds of mohawk wearing, dyed or shaved headed, studded, safety pinned and ripped fishnet stocking wearing kids would pack the joint at all hours of the night and early morning after punk rock shows. It's rumored to be the last place Darby Crash from the Germs hung out before he died - from the needle, not indigestion. A cool travel guide of the punk rock scene in LA is here. But don't let it's history scare you off. The look of the place may be run-down, although I just consider it eccentric. All four walls are covered with enough flotsam and jetsam to fill a flea market, and the hand lettered menu specials would make graphic designer and typographer Stefan Sagmeister envious. The clientele is all over the place, from high schoolers to too hip tourists, plus neighborhood old timers playing video games. 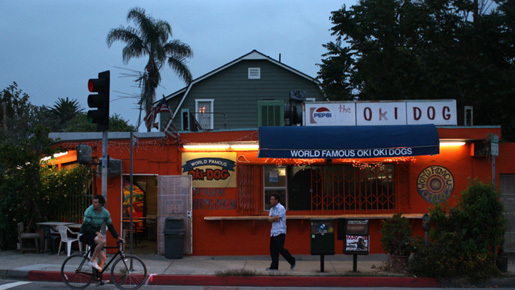 Oki-Dog could fit as a denizens hangout from a novel by beatnik writer William Burroughs. 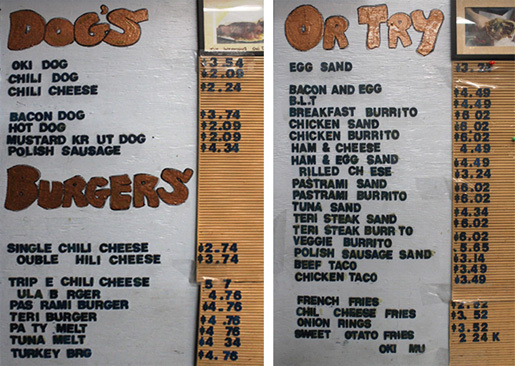 So what is The 99 Cent Chef's Cheap$kate Dining rating of 1 to 9, 9 being best for LA's famous Oki-Dog? Well, just check out my video below to find out. And be sure to stick around for the outrageous ending that features a 24 foot tall "Bad Dog" sculpture by Richard Jackson! Play it here, video runs 4 minutes, 19 seconds. And 99 thanks to Drew Redford for shooting the Chef. Great Facebook page, click here. also on 5056 W. Pico Blvd. facebook link for info and hours, click here. 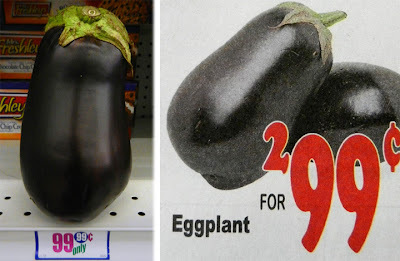 I like a recipe with just two ingredients. Especially when the recipe is as cheap and delicious as my Avocado Crema. When I stop at Leo's Taco Truck (video here) and top my midnight $1 al pastor taco with some Avocado Crema after a double feature flick at: the Hollywood Boulevard Art Nouveau Egyptian Theater, the most eclectically film programmed Cinefamily, the Quentin Tarantino benefactor of New Beverly, the Billy Wilder Theater run by UCLA Television Film and Archive in Westwood, or the movie house with the most seating legroom, Leo S. Bing at LAMCA. 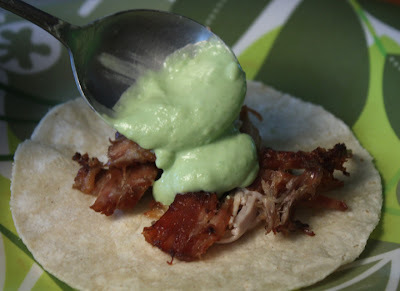 Fresh sliced off the fiery trompo my al pastor tacos get a dollop of avocado sauce for a perfect pairing -- cool and creamy, combined with charred slices of seasoned pork. Not all taco trucks and taquerias provide an Avocado Crema, so I am always on the lookout for it. And each taco kiosk has their own recipe. 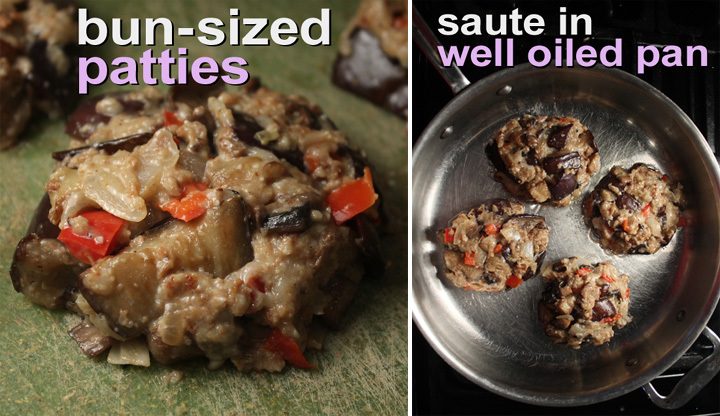 Some are watery and weak, others are thick and spicy, blended with cilantro and jalapeno. For my recipe, it's just avocado and Mexican crema. Here in L.A. my local Latin market often has sales of 7 small avocados for a buck. I like the compact size because it's perfect for a single serving. And Mexica crema is cheap enough. Mexican crema is a milder version of regular sour cream. This recipe is adaptable so try it with any sour cream you find on sale at your local market. 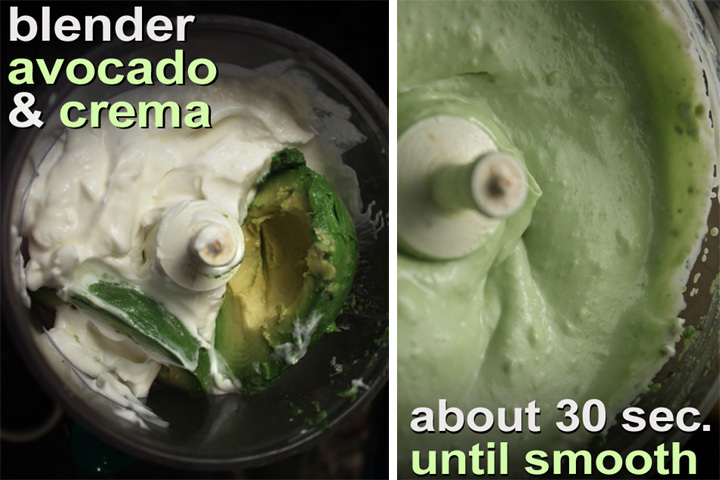 I know that avocados are expensive outside of California, but my Avocado Crema helps stretch out the expensive fruit. It's summertime and parties are happening all over town. My Avocado Crema is a perfect dip for chips and fresh chopped veggies like: carrots, celery, zucchini, cherry tomatoes, and crowns of broccoli and cauliflower. But my favorite use is as a taco topping. 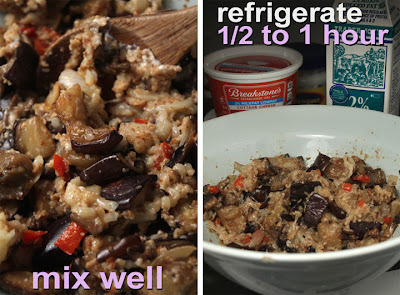 I have a slew of Mexican recipes you can try out, just click on any name to see the recipe for: Carnitas (pork), gringo-style Ground Chicken, Carne Asada (steak), Loxaco (Jewish Taco), Fish Tostada, Salmon Enchiladas, Chorizo and Eggs, Chiccarones (pork skin) and Potato Tacos. Last weekend we threw a Carnitas Taco patio party and I made three salsas. My Pico de Gallo (recipe here) and Salsa Verde (recipe coming soon) were perfect as a tortilla chip dip and taco topping. But the Avocado Crema got the most compliments and return visits. My latest rich and flavorful Latin recipe couldn't be easier to make. Be sure to set out a bowl full at your (or a friends) next party. 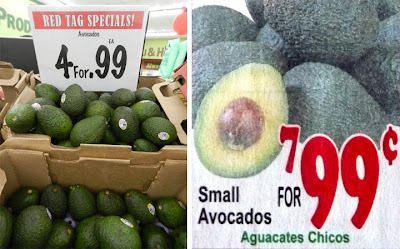 2 small avocados - or 1 large one. 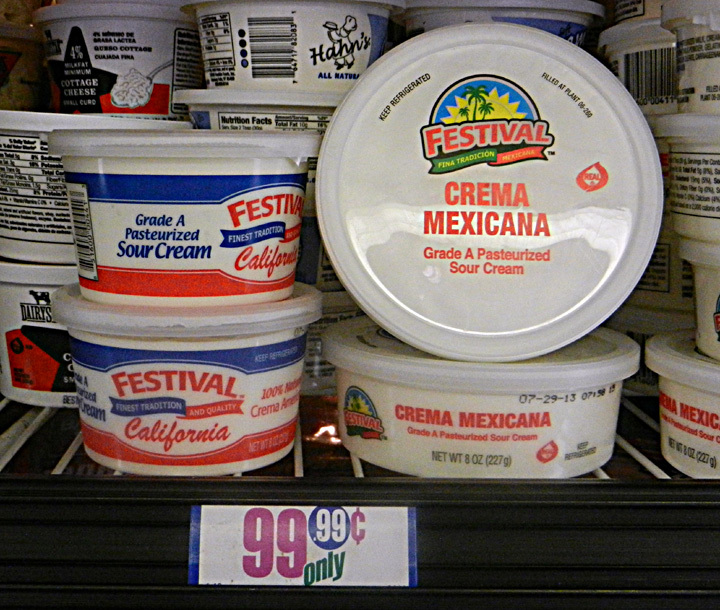 8 ounces Mexican Crema - any sour cream, low fat or regular. 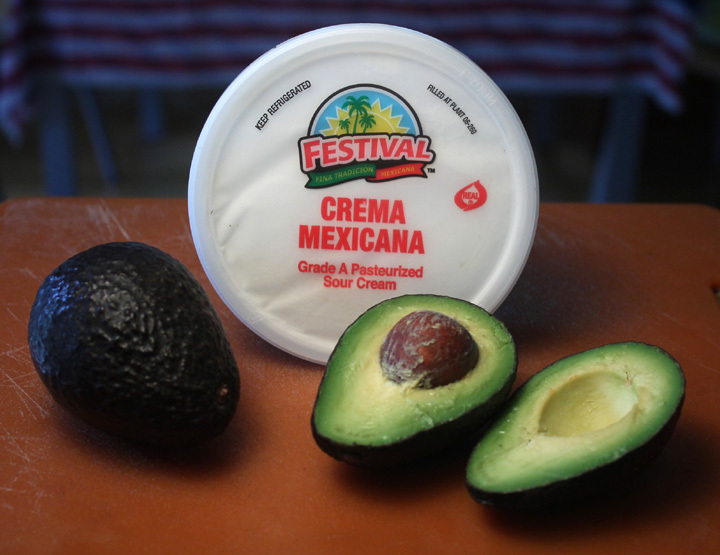 Mexican Crema has a slight sour taste just like regular sour cream. *Extra additions - a few sprigs of cilantro, slice of jalapeno (add a little at a time to desired spiciness,) and a teaspoon of lime or lemon juice. Couldn't be easier to make. Just slice avocado in half and remove seed then spoon out soft ripe flesh. Add avocado flesh and crema (or sour cream) to a blender or food processor. 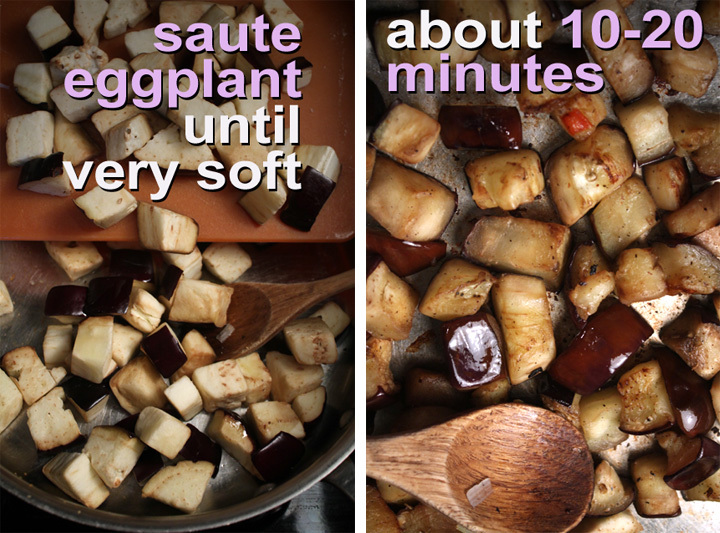 Pulse and blend until creamy, for 30 seconds or so. You could also just mash the avocado with a fork or potato masher and mix into sour cream. Then mash the mixture some more until fairly smooth. Doesn't have to be perfect, it's a pleasant surprise to bite into ripe avocado nuggets. Best to make fresh or a few hours before serving. Cover and store in the refrigerator. Place the avocado pits in the Avocado Crema to minimize discoloring. After a few hours there still may be a thin brown film, but will still taste great -- just do a quick stir before serving. Get out the chips, sliced veggies for dipping, or make one of my taco recipes and spoon it on. 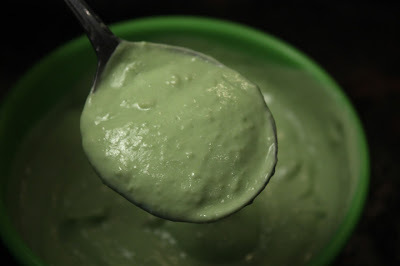 A teaspoon of lime juice will keep the Avocado Crema fresh-looking longer, but it will change the flavor, not bad, but I prefer it without. You could also blend in a few sprigs of cilantro, I like it this way too. My recipe is easy to double or quadruple for a large group. And you can use more or less avocado to suit your budget. And Store ripe soft avocados in the refrigerator until ready to use, they will last longer that way.